Who Will Rule? 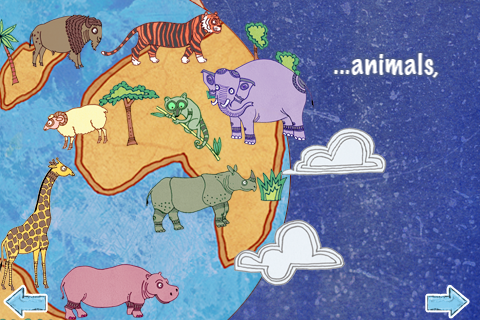 is an interactive storybook app based on an Australian aboriginal fable. The general story line is creatures of the air, land, and sea began to argue about who was going to be in charge. They decided the largest group would win. Once they all arrived, they found their numbers to be equal. It came down to which group could claim the platypus but he insisted they all share. It's a very simple story with a good message. The pages are filled with attractive folk art drawings. Click here to see additional samples of the artwork. My daughter likes this app's colorful pages and interactive features. There are things to discover on each page. For instance, when you tap the elephant, his head moves and you hear him trumpet. Let your child tap around the screen to find these surprises. 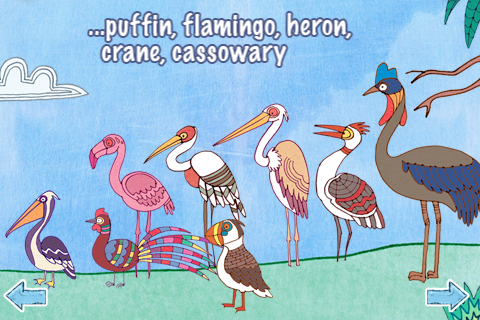 Part of the story includes the names of the animals lining up to be counted. I didn't know which names went with some of the birds. I thought about complaining about that but have decided it's a good chance for me to learn what a cassowary looks like. Who Will Rule? 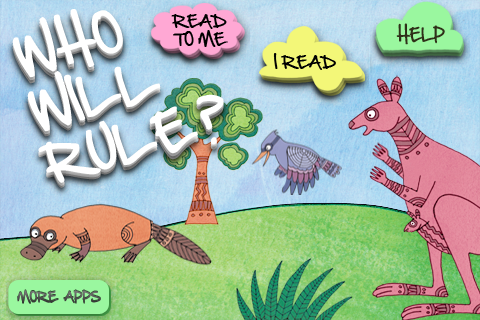 also allows you to choose who will read the story aloud. You can choose to have a young boy's voice or read it yourself. In additon, you can record your own voice for your child. The settings also have an option to distort the boy's voice in several ways. That's the one thing I don't like about this app but it's hidden in the settings so you can just ignore it. Overall, a great storybook app with enough going on to entertain a wide range of children. This app is available on iTunes for $2.99. See below to enter to win a free download of this app. 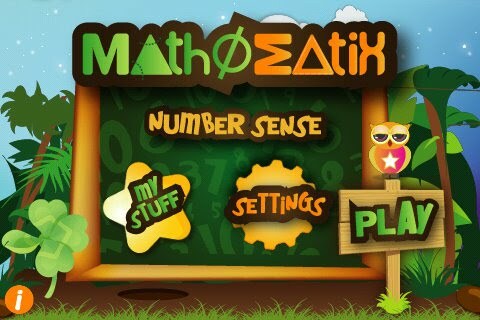 Number Sense is a math game app designed for children from 4 to 8 years of age. Within it are five different games, focusing on different tasks. Click here to take a look at some sample graphics. The games allow kids to practice counting, comparing and ordering numbers, subraction, and concepts of greater than/less than. Booster Balls--Kids practice counting and are rewarded by feeding a monster. Kindergardeners love silly so it should be a hit. Do the Dotty--This is a simple connect the dots game. Once the sequence is completed, a cute picture develops and the child can choose several colors for it. The pictures can also be saved in your iPhone/iPod's photos folder. 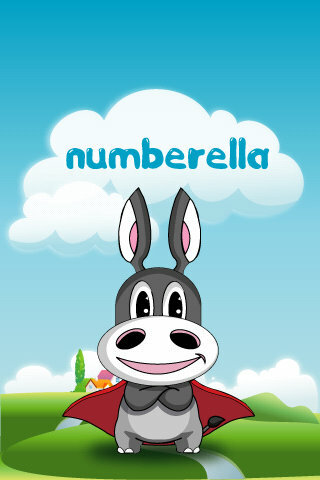 Numberella--This game encourages kids to compare numbers from 1 to 10. The super hero donkey is really cute. Try tickling him! The app gives reinforcing messages for right answers and positive correction for wrong answers. The donkey gets hit by lightning for wrong answers. That strikes me as a little harsh but maybe it's no worse than the Roadrunner cartoons I used to watch as a kid. Fishhoonka--Kids can practice greater than/less than/equal to concepts by moving fish from one side of the screen to the other. Toot Toot Train--Add or subtract cars to the train to send the train off to various cute candy named places. After successfully completing each game, the child gets a special award. They can admire these awards in the "My Stuff" bookcase on the title page of the app. This is a good app for practicing early math concepts with enough fun to keep kids coming back for more. It's on sale as of this writing for $1.99. The normal price is $2.99. Ready to enter to win Who Will Rule? You get one entry for each of the following. Please note each as a separate entry in the comments section below so I know what you have done. Mandatory Entry: Briefly tell me why you think your child (or grandchild or you) will enjoy Who Will Rule? Become a fan of Growing Up Disney blog on Facebook. 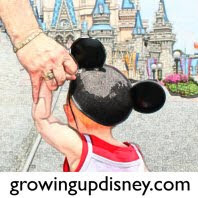 Follow Growing Up Disney on Networked Blogs on Facebook. Send a tweet about this giveaway (one per day). 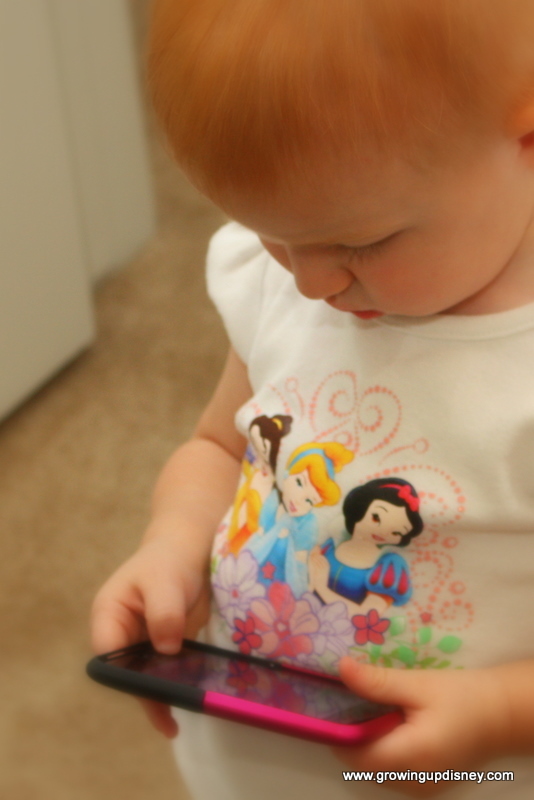 Feel free to copy and send this: "RT @Disney4Babies Visit http://www.growingupdisney.com/ for a #giveaway of a great children's app from Punflay, Who Will Rule? #Disney"
Add Growing Up Disney to your blogroll. Disclosure: I received apps from Punflay for reviewing purposes. No monetary compensation was received or offered. All opinions expressed are my honest thoughts on these products. Thanks Janine for all of your support! Here's a separate entry for you for Facebook. I'll count yours above for Twitter. I posted a comment yesterday but I don't see it today. I thought my DD2, Ellie would enjoy the animals on the app. She loves learning new animal sounds. My son loves anything on the iPad! I think he will love the story and bright colors! I think my son will love the animals, plus he's into anything on the iPhone when he has the special privilege of playing with it! My son loves to learn. Anything that I can give him he wants. He loves animals, letters, numbers, etc..
My son will love the animals, and is getting great at his numbers, and he just loves learning in general. This will keep him busy on flights to WDW! I'm a fan on FB and follow you on Twitter, subscribed to the feed and RT'd too! You know I love your site, keep up the great work! Congrats to Meredith! She won the app. Thanks to everyone who entered!! !